We recently took delivery of the support brackets for the water tanks which were quickly bolted on to the chassis and painted in primer. This is another fine piece of construction from the Dave Hewson and TR Fabrications Ltd. alliance and can be seen in the photograph. 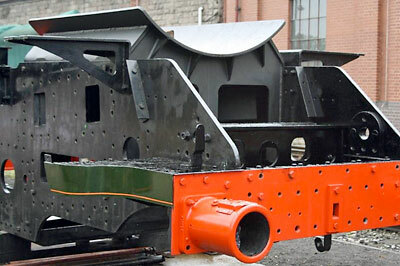 Progress continues with the formation of the front footplating and the drilling of the holes into the smokebox saddle sides is nearing completion. In the machine shop machining of the fork ends of the cross stays is underway although by no means finished. 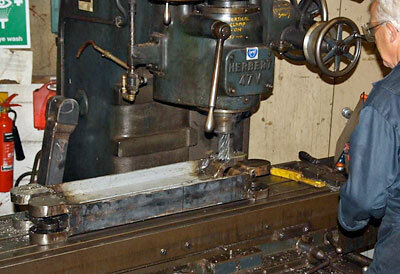 There are a total of fourteen fork ends to receive the attention of the milling machine. 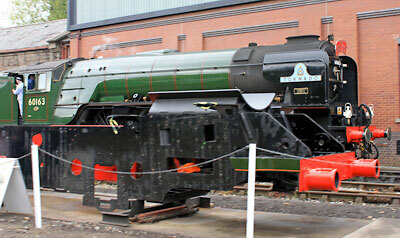 Efforts to leaflet some of the Tornado-hauled workings were largely frustrated as the trains were so full that it wasn't possible to make progress through the coaches. Thanks to our colleagues Paul Anderson and Neil Cocksedge for their valiant efforts. We realise that this activity must always be low-key as it can have the opposite of the desired effect and annoy people! Nevertheless, we had an excellent weekend, with a huge amount of interest in 82045 from the public and many leaflets taken. The Friday and Saturday working parties certainly added to the interest of the scene, and there was a great deal of enthusiasm shown in the project itself. 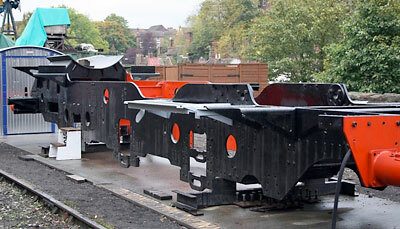 Visitors to our site at Bridgnorth will see that we now have a smart new shed adjacent to the chassis of 82045. We would like to express our sincere thanks to Chalky White's Wailing Wall Construction Company for their speedy and efficient work in erecting it for us. Its shiny panels will soon be covered in dull black as per the official GWR 'livery' for utilitarian buildings not sited immediately on a station. The shed is already proving invaluable for storing our everyday kit, as well as providing shelter from the elements. Needless to say, there is absolutely no intention to store any high-value items in it. 82045 shows a splash of colour as "Tornado" runs round at Bridgnorth during the SVR Autumn Steam Gala. Photo: Dave Giddins. The water tank support brackets bolted on to the chassis. 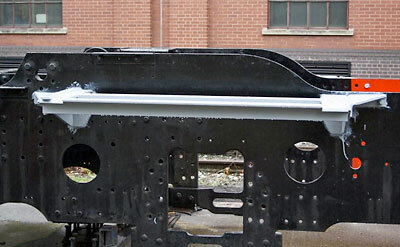 And Chris couldn't resist lining-out this section of running plate - just to hint of things to come! Richard Fraser machining two cross stays on the Herbert milling machine.